I grew up with a lot of music in my house. My parents regularly played Creedence, The Beatles, The Band and Janis Joplin. As a little girl, I ballroom danced to Chopin in our living room with my dad. When I was ten or so, on a particularly long car ride, my dad asked my sister and me to debate him on the merits of Beethoven vs. Milli Vanilli (for the record, I’m still pretty sure we won). I played piano for almost ten years. Music was important to us. And so I want it to be important to my babies. You’ve heard all the studies on the kids who listen to Mozart and Bach in the womb turn out to be rocket scientists or presidents. For what it’s worth, I found myself listening to a lot of Nina Simone during my pregnancy which would indicate my kids will grow up to be lefty badasses (I can only hope). What’s been really cool is that our son has shown a very early interest in music. Just last week I was feeling really stressed while driving everyone around. He was crying and fussing over the sun being in his eyes and his pacifier falling out (see earlier post on how often I pick up pacifiers) and nothing, I mean NOTHING would quiet him down. I put my ipod on shuffle and “Trenchtown Rock” came on. It’s a really good live version from 1975 that is especially jam-my. 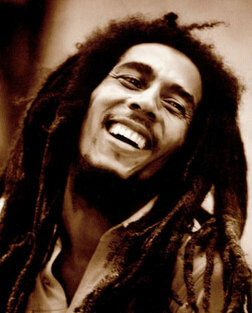 From the moment Bob said “One good thing about music, when it hits you feel no pain”, my son started smiling and giggling. And it wasn’t just a passing thing like gas or a funny shape or a sneeze. It was an actual response to what he was hearing. He continued to giggle and coo and smile widely for the entirety of the song. I was struck by the moment and the words of the song and how therapeutic music has been in my life and continues to be. I’ve always taken comfort in the fact that no matter what happens in the world, songs that have once been will always continue to be. In other words, you can’t ever steal “The Weight”, “Ruby Tuesday”, “The fifth movement” or even “Blame it on the Rain” (as a side note, in sixth grade my friend and I dressed up as Milli Vanilli for Halloween. This entailed us wearing matching jean jackets and braiding hundreds of little braids in our hair. Not remembering that we were both white and female, we felt confident people would know who we were. Nobody did. They thought we were “punks”. My dad quickly made us each a sign-one with Milli and one with Vanilli. Who knew Milli Vanilli would play such a crucial part of this post? ).